One thing about living in a world city like London is the totally different class of vegetarian restaurants available. In many towns, the vegetarian establishments are typically cute and quirky but not particularly fine dining. Don’t get me wrong, I love my quirky and fun veggie restaurants, but it’s nice to branch out for a special occasion. The name, Vanilla Black, creates images of stark contrasts. The establishment rides on this theme with a fine but demure atmosphere. During lunch the crowd was mostly polite people in business attire and a solo me in my denim and trainers plopping down a humongosized hobo bag with camera, maps and books spilling out the edges. At the moment, I felt like Vanilla in a world of Black, but it was lunch and I had been on the lookout for upscale vegetarian dining for a while. 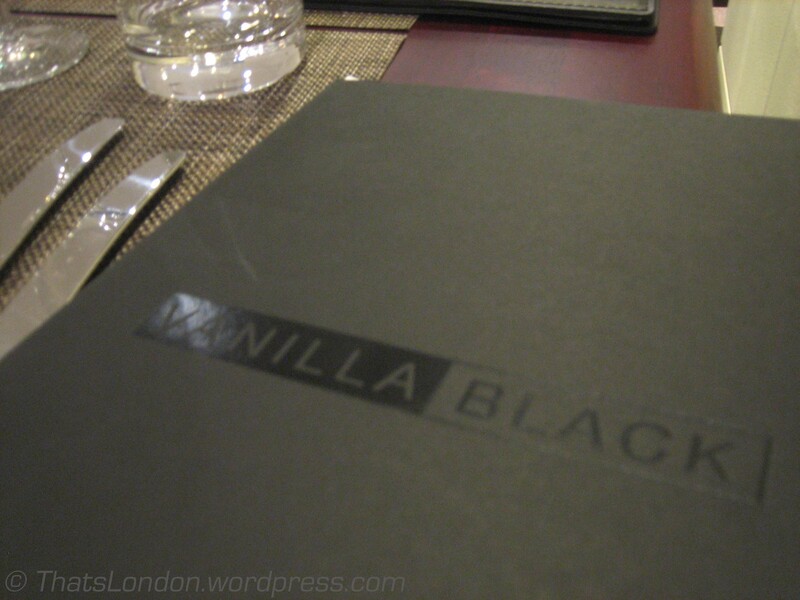 Weekdays from 12-2:30 Vanilla Black has an amazing set menu of 2 courses for £18 or 3 courses for £23. I decided on 2 courses: an appetizer of Sweet and Sour Glazed Baby Beetroot with Candied Fennel and Wasabi Cream and a main of Asparagus and Chervil Pesto Crumpet with Yoghurt Curd, Potato Cakes and Leek Tagliatelle. 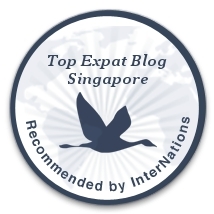 The staff was courteous, polite and attentive but formal. 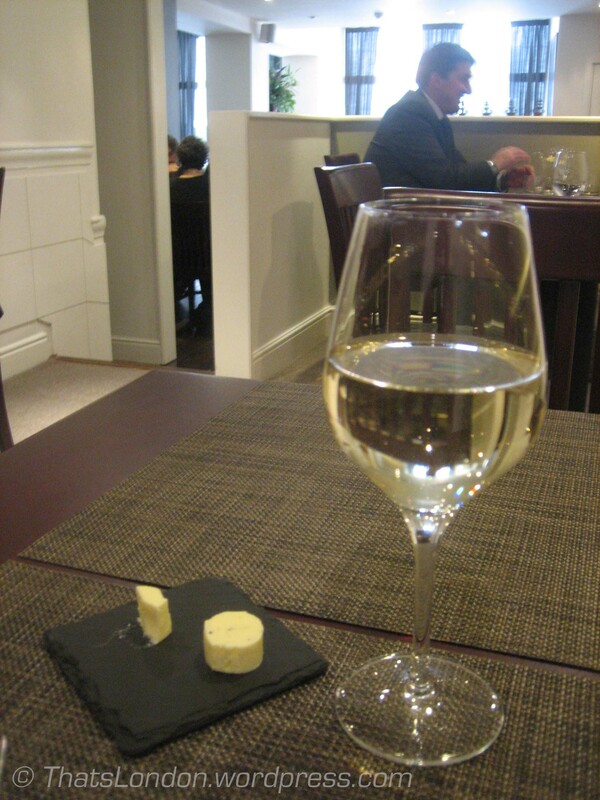 In keeping with the contrast theme, the server brought bread with sea salted butter and black peppered butter which I immediately chowed down on along with a glass of white wine. Sea salted and black peppered butter for the bread, wine. 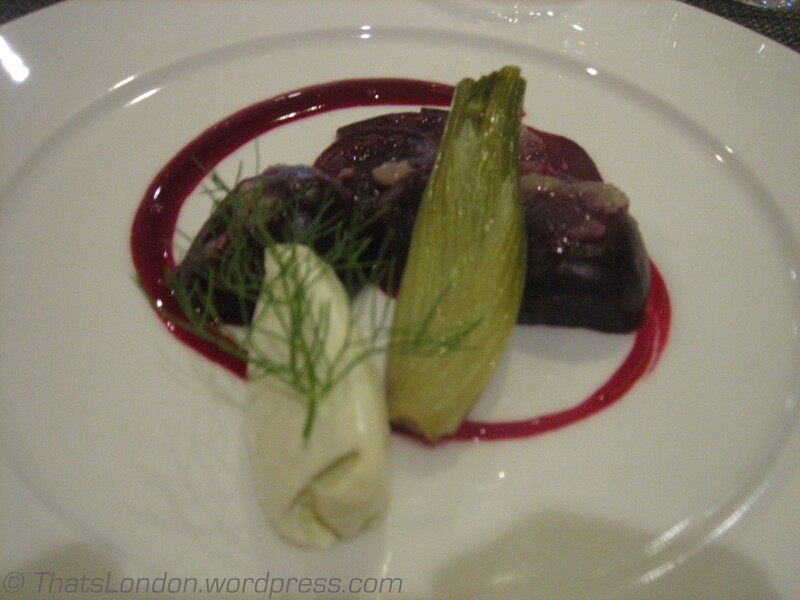 The wonderfully presented beetroot dish had the most amazing wasabi cream. The power of the wasabi mixed with the cooling cream made an unusual but perfect pairing and flowed nicely with the natural sweetness of the beetroot. The unlikely combination of ingredients were proving to be well thought out and delightful. I conquered every bite of the beetroot and was anxious for the main course. “This is what crumpets are?! ?” I thought as I vowed to eat crumpets every day. 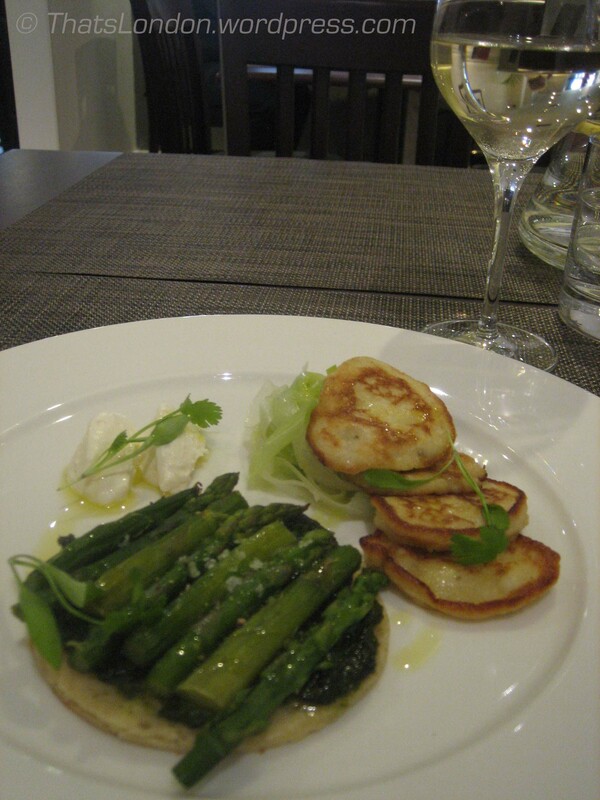 The aparagus, yoghurt curd, potato cakes and leeks were extremely pleasing. At this rate, my ordering skills were having a 100% success rate. I decided to go ahead for the dessert. The plates were small-ish, I reasoned. The peanut butter parfait sounded a bit rich so I chose Olive Oil and Vanilla Roasted Pineapple with Chili Syrup, Mango Pureé and White Chocolate Ice Cream. That’s where my lucky streak ended. 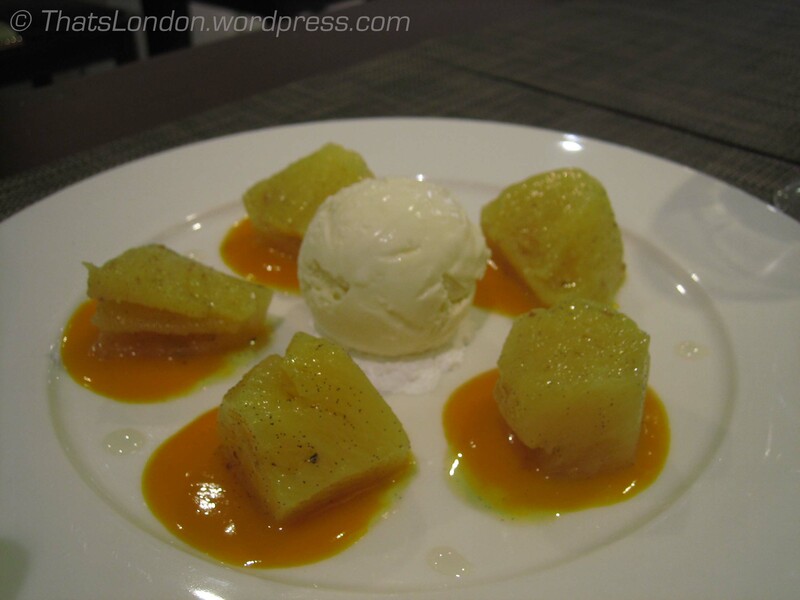 The Pineapple overpowered all the other ingredients and left the dish feeling stagnant. It wasn’t bad, it just didn’t live up to the expectation after the other two courses. Bottom Line: Vanilla Black works the contrast theme with amazing and inventive results. The pricetag is a little hefty for everyday, but the restaurant boasts a decent set lunch best with dessert skipped.